Rust- and cream-colored rocks form layers like a fancy birthday cake. Wind- and water-carved cliffs and buttes dwarf the campers at their base. Soaring stone pillars bring to mind the ruins of ancient civilizations. This must be Utah, you might think, but it isn't. Nor is it the red rocks park outside Las Vegas. It's not Colorado's Red Rocks Amphitheatre either. In fact, these red rocks are in the middle of California's Mojave Desert, where the southernmost tip of the Sierra Nevadas meets the El Paso Mountains. California's Red Rock Canyon State Park is a place that few state residents know about, and even fewer have visited. It's a small park and seldom crowded, but it's also one of the most eye-popping landscapes in Southern California. Don't let your GPS or online search get you confused. There’s a Red Rock Canyon park near Las Vegas, and of course, there are red rocks in Utah, but this park is in California, just off California Highway 14, which is sometimes called the Aerospace Highway. Red Rock Canyon is about 1.5 hours' drive from Los Angeles. It’s past the town of Mojave if you're on the way to the Eastern Sierras, Mammoth Mountain or Death Valley. For more information about the park, visit the Red Rock Canyon State Park website. The most popular things to do at Red Rock Canyon are hiking, photographing, and stargazing. You may also find wildflowers blooming after a wet winter, from mid-March through April and sometimes into May. During that time, call their wildflower hotline at 661-724-1180 to get the current status. 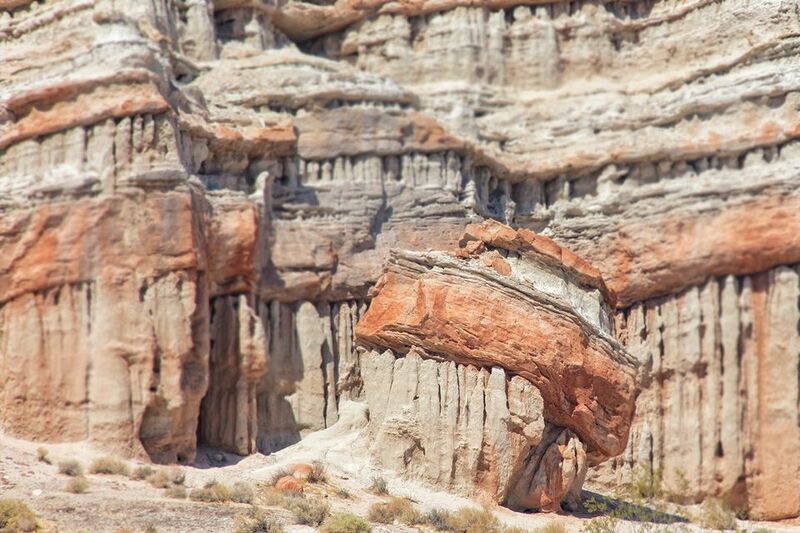 You can see some of the rock formations from the highway, but don't just speed past. Take a detour to explore the unique landscape instead. You can drive around part of the park in a family sedan, but you can see more of it from your vehicle if you have four-wheel drive. You can find a map of the driving routes at the park's website. In the spring and fall, members of the Red Rock Canyon Interpretive Association lead guided hikes in the park. In spite of what you might read elsewhere, the official policy is that dogs must be on a leash and are not allowed on the trails. With only the tiny town of Cantil nearby, Red Rock Canyon's night skies are free of light pollution. Red Rock is an excellent place to watch a meteor shower. You can find a meteor shower calendar on the StarDate website. Unless you love to bake in the hot sun, avoid Red Rock Canyon in the summer when temperatures soar. The park is open then, but the visitor center will be closed. The park's website says water is available, but you may want to bring your own just in case something goes awry. There's also a restroom near the visitor center, but the campground has pit toilets only and no showers. Don’t forget the park's small entrance fee, which helps pay for the park's upkeep. Bring cash and use the self-registration center at the entrance. Depending on your cell phone carrier, you may find yourself with no service in and around the park. Red Rock Canyon has 50 primitive campsites, including four ADA-compliant sites. They can accommodate trailers and motorhomes up to 30 feet long. All sites are available on a first-come, first served basis with no reservations required. There is a camping fee, which you may need to pay in cash. The park website lists current rates. Most of the year, you can find a campsite on a moment's notice, but it may fill up on spring and fall weekends, especially over three-day holidays. During those times, they suggest that you try to arrive on Thursday evening or early Friday morning. The campsites are spaced out, and each one has a fire pit and picnic table, but there is no shade until late afternoon when the sun drops below the red rock cliffs behind the campground. The campground has pit toilets only and no showers. If that's not your idea of fun, you may be more comfortable in a self-contained RV. The campground has no hookups, and the dump station may be closed due to water restrictions.